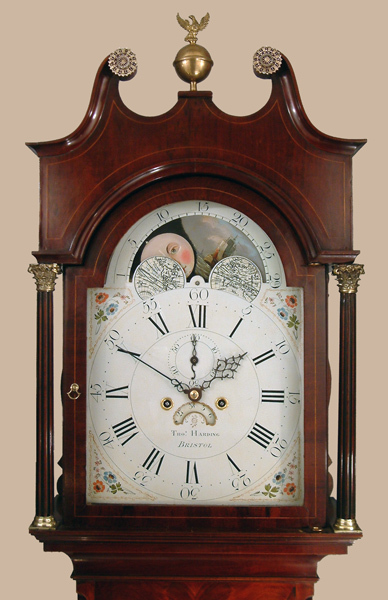 Thomas Harding of Bristol Longcase Mahogany Circa 1810 - Height 93in. 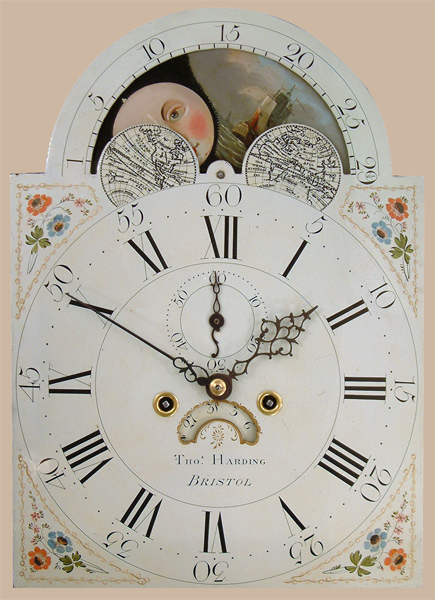 This Longcase Mahogany Archive's Maker - Thos. ( Thomas ) Harding of Bristol is recorded apprenticed to Edward Bird October 11th 1797, became Burgess Jan. 21st 1805, married 1810. Long door, figured mahogany case with swan neck pediment and central eagle/ball finial.Corinthian capitals to fluted hood columns. Boxwood stringing to hood, trunk door and base. Typical Bristol area canted corners to trunk. Good quality 8 day movement with 4 knopped pillars and hourly ( rack) striking. Thos. ( Thomas ) Harding of Bristol is recorded apprenticed to Edward Bird October 11th 1797, became Burgess Jan. 21st 1805, married 1810. 93" ( 236 cms. ).